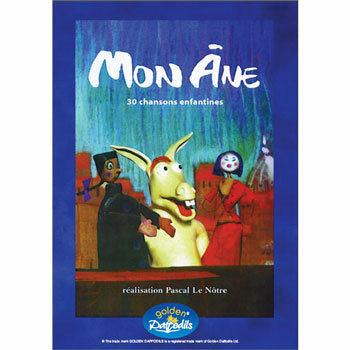 Mon Âne is an animated collection of 30 traditional French children's songs. Each song is sung by native speakers and features a mischievous donkey in the animations. The lyrics to each song appear at the bottom of the screen (in French cursive writing) and there are 20 karaoke-style versions of the songs for class performances. There is a menu so each song can be selected for individual playback as required. 10. La capucine 25. Savez-vous planter les choux? 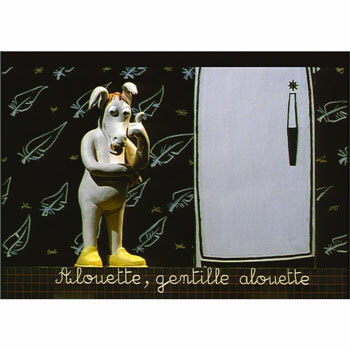 Mon Âne was originally produced for children who are native French speakers. It is a great resource for supporting listening, speaking and reading in young children who are learning French as a foreign language. I bought this DVD for my niece who loves it. The animation is great and the songs are all classics. A great purchase. My 2 year old is fluent in french and english and really likes this dvd. She says "encore" at the end of each song! Her parents find the animation quite amusing too! It is an expensive dvd but well worth it to help encourage a child's french singing and understanding. 2 respond positively when used within the lesson. It is so French!!!! This is a great DVD with lots of children's songs sung by children. The song lyrics appear along with the song on screen so you can sing along. The words could sometimes do with coming up a little faster or a printout of the lyrics would be useful. The animation is lovely and funny and, without any idea of what the songs are about, it is perfecyly watchable on its own. 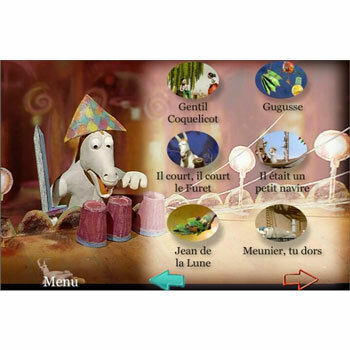 This is for French children so translations are not provided which would also be useful for when we get stuck! The credits for each song appear directly after each one which can get annoying especially when a song is particularly short. I would prefer the songs one after the other and a whole list of credits at the end. My children like it and we have our favourites that we sing along to. There's always Frere Jacques to start with! It's quite expensive compared to other DVDs and doesn't have any extras. I would buy it again though. Really good, all the children that have seen it enjoyed the catchy tunes and loved the animation. Service was excellent - it arrived 2 days after ordering.